Some Highlights of the November 28th MR3 Update | A . T . T . N ! Just a few highlights from the update. Some are new features, others are fixes to issues experienced by on-campus users. An accessibility checker is now available within the HTML Editor for use within Content, Widgets, Quizzes, Assignments, Calendar, and any other tools where an instructor or student can access the HTML Editor. The accessibility checker is available on the HTML Editor bar. After you add content to the HTML Editor, you can click the checker to ensure that the HTML page conforms to WCAG and Section 508 accessibility standards. This is a fix. Since the last update it has not been possible to use any of the Assignment folder conditions as a release condition. With this release this bug has been squashed! The Long Answer (LA) question type (Quizzes, Surveys) has a new name: Written Response (WR). Nothing about the functionality of the question type has changed. Previously, icons displayed in Content to help users distinguish between content file types (for example, an icon for a video topic or an icon for a discussion topic). Now, icons reflecting the Daylight look and feel are re-introduced in Content. These icons are visible in the main Table of Contents view, the Module Content view, and the Table of Contents fly-out menu when viewing a topic or activity. To discourage cheating in quizzes, instructors can now shuffle the order of all questions in quizzes or specific groups of questions (sections) in quizzes. For example, an instructor could shuffle questions 1-10 in a quiz, or shuffle questions 3-10 (grouping those questions into a section) and retain the order of questions 1-2 at the start of the quiz. 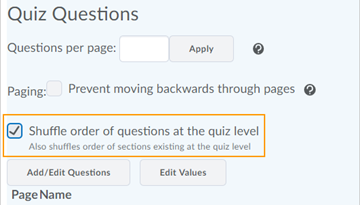 When editing a quiz in the Quizzes tool, a new option to Shuffle order of questions at the quiz level displays in the Quiz Questions section. When creating a new section to group specific questions in a quiz, a new option to Shuffle order of questions in this section is visible in the Display Options section. Once the shuffle option is selected, a shuffle icon appears next to each affected question in the quiz. 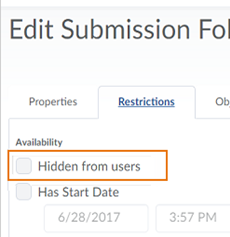 Instructors can now set the visibility state for draft content within assignment submission folders in Content and Assignments. When content is in a draft state, it is not visible to learners in Brightspace Learning Environment. When instructors have set the visibility to draft, the hidden icon appears in the instructor view of the assignment.